Sunglasses (and even occasionally eyeglasses) like to go missing almost as often as keys and left socks. But be honest, you don’t really have a good place for them do you? You might have a few spots you tend to leave them, but if there’s not a single designated spot for your specs then you’re bound to lose them at some point. And you probably feel pretty foolish every time you tear your house apart looking for them (especially that time you had them on your face the whole time). But from now on you can leave looking foolish over your glasses to one of these whimsical glasses holders instead. 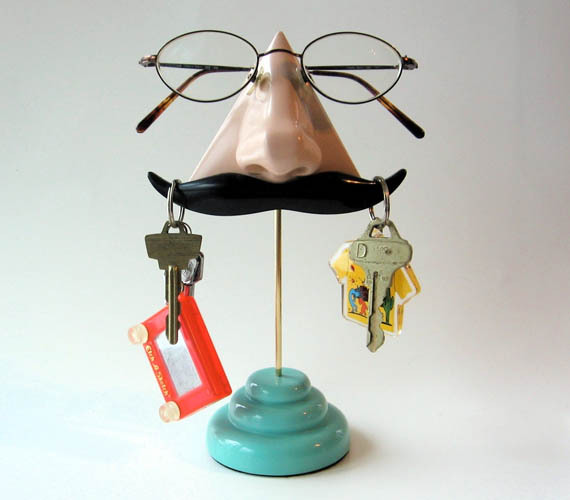 These silly nose stands make the perfect place to keep your glasses. Some stands also include mustaches which double as key hooks.